Today the ATF released new processing times based upon December 2013. 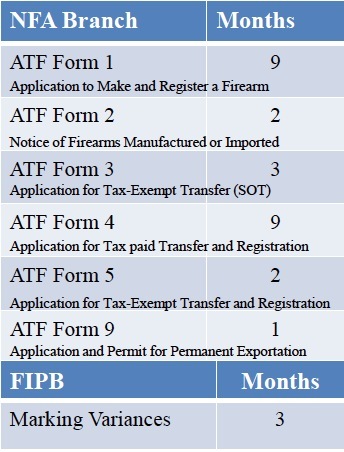 The are now reporting the the average times for processing an ATF Form 1 to make and register a firearms is 9 months and the average time on an ATF Form 4 to transfer and register a NFA firearm in 9 months. We have seen significantly reduced times when applying electronically. 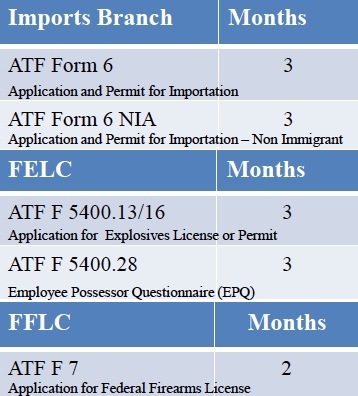 Below are the times for each type of transfer and or application as reported by the ATF. It is interesting to see that they are taking 3 months to approve / process a transfer on a Form 3 and 2 months on a form 2. That means, it is taking ATF 2 months to approve the manufacture and 3 months to approve the transfer to a dealer. More than 5 months are required just to make and send a suppressor to your dealer so that you can wait an additional 9 months to take it home. The ATF will update this information every 90 days so we can see the trend. As more people file electronically, we could start to experience longer wait times but for now we are hearing that many electronic Form 4s and Form 1s are taking between 3-6 months instead of 9-12 months for the traditional forms. While a Gun Trust or other forms of ownership can allow you to purchase Silencers or other Title II firearms in states where they are legal, it is important to realize that just because you or a trust own a Silencer or other Title II firearm, you do not have the ability to take those items to states where they are illegal to possess. For example silencers are not legal to purchase, own, transfer, or use in Illinois. Recently an individual was arrested for threatening police and possession of an illegal silencer. 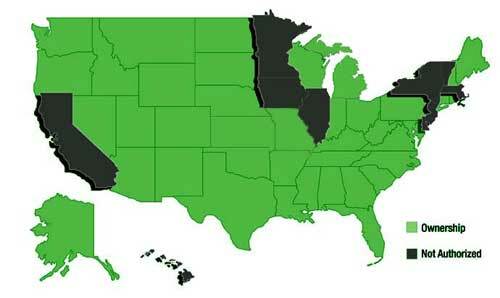 The silencer may have been legally purchased but its presence in Illinois is a crime and will make the silencer illegal. While it sounds like Gali, the individual with the illegal silencer, is in a lot of trouble, the additional penalties for possession of a silencer could add up to more than 10 years in jail and a $250,000 penalty plus seizure of the vessel (his car) that the illegal silencer was found in. Do I Need a Class 3 License to Buy a Silencer? 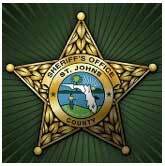 A Class 3 license is a license that a dealer obtains to sell Title II Firearms. Many individuals incorrectly confuse the terms Class 3 and Title II. We even see some lawyers making the same mistake. Class 3 SOT is a license to sell. Title II is classification of firearm that a Class 3 SOT may sell. Title II firearms include silencers, short barrel rifles or shotguns, machine guns, AOWs and destructive devices. So the answer is no! You do not need a Class 3 license to buy a silencer or other Title II firearm unless you are a dealer and wanting to purchase them for resale. If your documents do not use the correct terms, the people who wrote them may not understand the NFA, ATF and issues relating to the purchase, possession, transfer, and use of Title II firearms.